My first exposure to Preston Singletary's fairly unique take on glass art was at the Mint Museum of Craft + Design, here in Charlotte. The museum's collection includes one of Preston's well-known glass hats. These hats are modeled after Native American hats of the Pacific Northwest, and include sandblasted symbols such as wolves, ravens, eagles, and bears, all from Preston's tribe, the Tlingit (pronounced "klink it"). These symbols are unique to each tribe and can only be used by permission... since Preston is Tlingit, he's permitted to use their designs in his work. 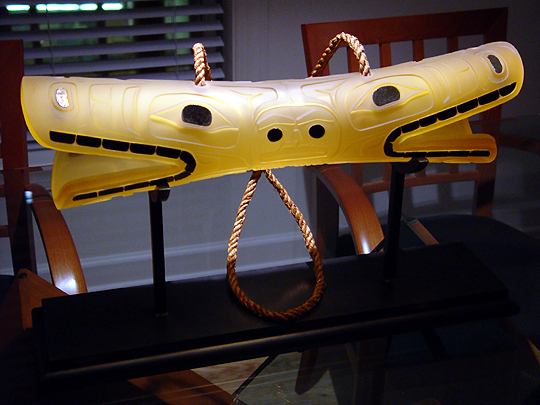 This work is modeled after a shamanic device known as a soul catcher, or Káa Yahaayí Shatl'ékwx'u in Tlingit. Soul catchers are carved from hollowed bone (such as the leg bones of a bear) and often contain inlays of abalone or other precious materials. Each end of a soul catcher is carved to resemble the head of an open-mouthed creature, such as a wolf or snake. In the Tlingit belief system, if a person's soul becomes lost while separated from the body during a dream, or if the soul is driven out by witchcraft, a shaman may be enlisted to find the soul, capture it in a soul catcher, and then restore it to the afflicted person, thereby preventing illness from invading the "empty" body. Soul catchers are prized possessions, and are handed down from shaman to shaman within a tribe over generations. To create this glass soul catcher, which is about four times the size of a real soul catcher, Preston first created a cylinder of glass in the approximate shape of the final form. He then used sandblasting and coldworking to create the mouth slits on each end of the work (four slits total). Next, Preston added tape to the outside of the work, stenciled and removed the areas of tape for the design he wanted to create, and then sandblasted away the glass to create the final design. To create the eyes, nostrils, and teeth (areas known as ovoids), Preston applied black Bullseye glass which had been iridized by exposing it to chemical fumes while in a molten state. The black glass was then affixed to the work with silicone. Because this glass is iridized, it may not appear black; the first time I saw an image of this work, it looked like gold leaf. This is the first work in which Preston has applied this technique, and it works really well. Preston then drilled two holes in the top of the soul catcher and added a section of rope hand-woven by Lisa Telford, a weaver of the Haida (pronounced "high dah") tribe, a sister tribe to the Tlingit. Finally, Preston coated the entire work in several layers of (believe it or not) Rain-X, the windshield treatment that repels water, to protect its surface. Because this work is very round, it can't just rest on a smooth surface... it wants to roll, which is not a good thing. And, because of the Rain-X coating that's all over the work, I couldn't attach any rubber or felt feet to stop it from rolling... they just wouldn't stick. So, when I spoke with Preston about this problem, he offered to have a stand designed that would display the work safely, and in a way that would accentuate the Tlingit influence in the work. Hahn Rossman of Alki Foundry designed and built the stand you see here... it does a wonderful job of displaying the work. This work is full of dualities. For example, Preston has managed to combine an ancient concept, the soul catcher, with modern concepts such as glass blowing and sandblasting... the result is high-tech, but primitive at the same time. Another example of duality in this work is its two heads... besides the intended Tlingit reference, this is similar to depictions of the Roman god Janus, who had one face looking to the past and one face looking to the future... it almost makes me think that in this soul catcher, one face is looking to the Tlingit's heritage, while the other is looking to their future. The artistry of the engravings, which are all based on Tlingit designs, is really spectacular... Preston knows how to translate designs from traditional media such as wood and stone to glass. This is an excellent example of Preston's work... I'm honored to have it in my collection. From July 2009 until some time in 2012, this work is on loan to the Museum of Glass in Tacoma, Washington, as part of Preston's show Preston Singletary: Echoes, Fire, and Shadows. It's a distinct honor to have been asked by the museum if they could borrow my soul catcher  I hope that everyone who sees it in the show enjoys it (and the rest of the show, which is amazing). I know I'll miss having it around!